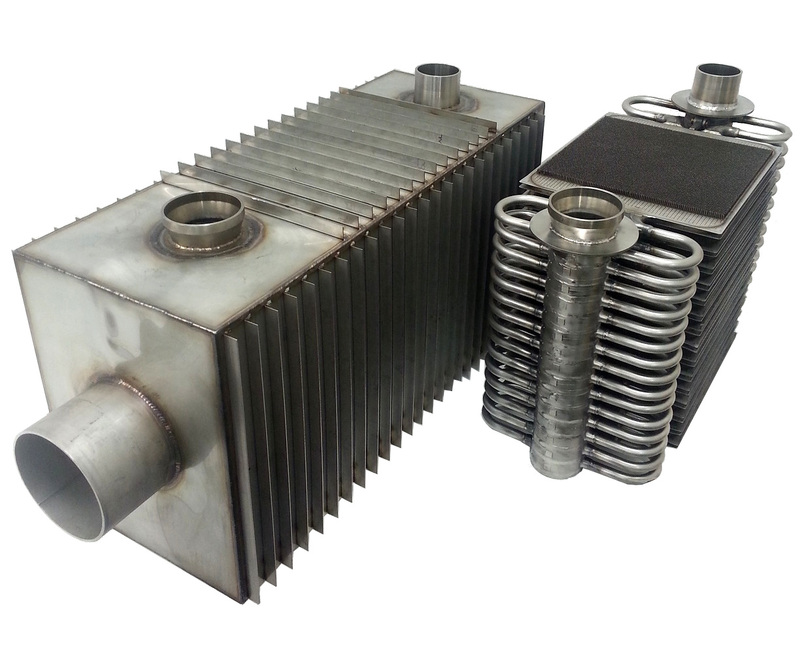 The core technology at Hiflux is a high temperature recuperator specifically developed for gas turbine applications. Innovative design and state of the art modelling tools have been used to create a patented design that has the right combination of strength and compliance required for high temperature operation. An array of pins, laser welded to plates, form the heat transfer path as well as providing structural integrity. The Hiflux design is made up of a number of identical cells, each cell consisting of two plates joined by pins. The cells are very strong and well suited to withstand the load from a pressurised fluid. The cells are linked together by a novel flexible manifold to accommodate large thermal displacements. Hiflux recuperators are able to operate at higher temperatures than conventional thin foil technology which means microturbine designers can use more efficient hotter thermodynamic cycles, with inherently higher exhaust temperatures. With a counterflow arrangement, a high effectiveness can be achieved. Hiflux customer units typically achieve an effectiveness of approximately 90% and total pressure loss of <5%. A reliable high-temperature recuperator is a key component in microturbine-generators, and Hiflux recuperators have operated for tens of thousands of hours at up to 800°C. 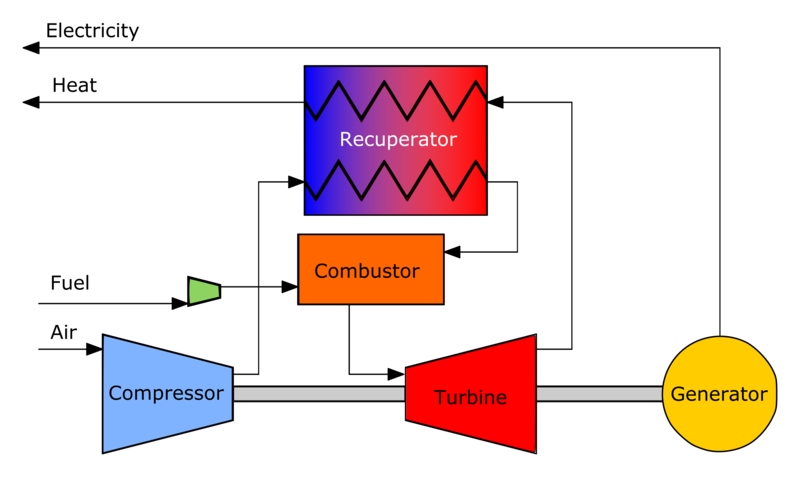 Without a recuperator, the electrical efficiency is not high enough to be commercially viable. The recuperator is a heat exchanger that transfers heat from the exhaust stream of a gas turbine engine back to the air before it goes into the combustor. This reduces the amount of fuel burned, doubling the electrical efficiency of the system and making the recuperated microturbine the optimum microCHP power source. 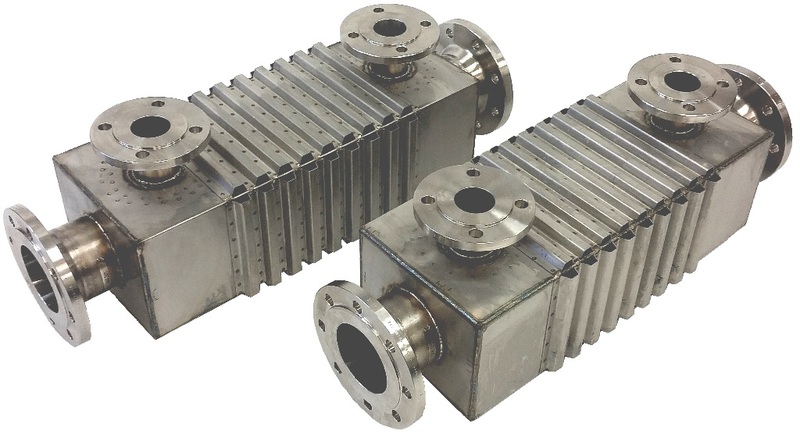 However, the mechanical and thermal demands placed on a recuperator are significant, and many recuperator designs have proven to not meet service life requirements. The main market for small microturbine-generators is in microCHP. When electricity is generated centrally at large power stations, at least 50% of the energy in the fuel is wasted as heat released into the atmosphere. Further losses occur when the electricity is transmitted large distances through high voltage cables. This wasted energy, coupled with the infrastructure and maintenance costs of power stations and transmission networks, is the reason that electrical energy has a higher economic value than heat. Generating electricity locally from a single fuel source in a combined heat and power (CHP) scheme can yield very high overall efficiencies since both electricity and heat can be used at the point of generation. 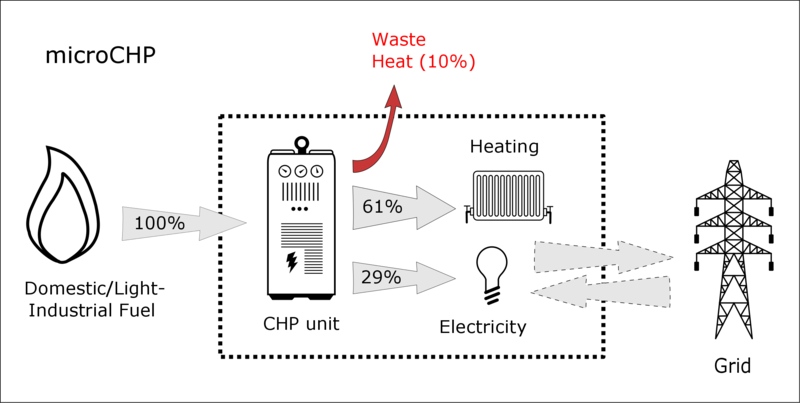 MicroCHP is the co-generation of electricity and useful heat at the domestic/small business scale. These systems are grid-connected and the end user can export unused electricity back to the grid or import additional power at peak usage times. Small scale electricity generation in domestic, commercial and light industrial premises is attracting interest from utility companies and could offer reduced energy costs to the customer. It also eliminates the need to increase grid capacity and build large power stations. Boiler manufacturers are also engaged in microCHP as they seek the next generation products to replace condensing boilers.